Today, based on the halving clock, the Bitcoin block reward will be halved from 25 Bitcoins to 12.5 Bitcoins. When miners started to mine Bitcoins, they were rewarded 50 Bitcoins for sealing a block on the blockchain ledger. In November 2012, the reward was halved to 25 Bitcoins, and now it's decreasing to 12.5 Bitcoins. With the halving event we're doing the same, but not halving rewards. We are halving our house edge! Meaning, you'll have a higher chance for winning! 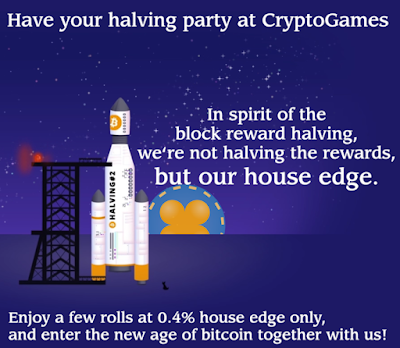 House edge halving will take place around the Bitcoin halvening event and will last for few hours. Join us for this amazing event and catch the winning spirit at CryptoGames!